Using a great organizer when you are on the go is key. Especially when you are a mom and are juggling bags, sippy cups, keys, a phone etc. I put things down all of the time and forget where I put them. With this wonderful stroller organizer from Pure Bliss, there is a place for everything. My phone, keys , a sippy cup or two..etc. I attached it to my running stroller and am ready to go! "The Mercedes Benz of stroller organizers! That’s what our customers say. Unlike many other brands, the Pure Bliss Stroller Organizer has been DESIGNED TO SPECIFICALLY HANDLE THE PROBLEM OF DRINKS SPILLING! Reinforced cup holders keep drinks firmly in place to guard against sloshing around and spilling. Plus they’re double insulated to keep your drinks hot or cold longer. Made of thick, high quality material. Features adjustable Velcro straps that are intelligently designed to accommodate various handle angles which easily attach to most strollers, including pet strollers with handles between 13 and 21 inches wide. The collapsible design will not interfere with folding your stroller. Made of eco-friendly machine washable fabric (please air dry): BPA-free and Phthalate-free for your peace of mind. The large center compartment has a magnetic closure, which is not only elegant but smart, because it will not wake the baby when you open it. It’s big enough to hold diapers, wipes, snack, small toys or your wallet. The two outer pockets are great for keeping your cell phone and keys within easy reach. The middle pocket is lined with microfiber to protect sunglasses from getting scratched. The Pure Bliss Stroller Organizer comes with a No-Hassle LIFETIME MONEY BACK GUARANTEE. If you are not 100% satisfied for any reason, return it for a full refund. – Plus you will receive FREE SHIPPING with Amazon Prime membership or if your order totals $35 or more. FREE ebook – “55 Fun and Educational Activities To Do With Your Baby or Toddler” with your purchase of the Pure Bliss Stroller Organizer. This book is loaded with fun and creative ideas you can do with your baby, both indoors and out, summer or winter! Download instructions will arrive with your package. 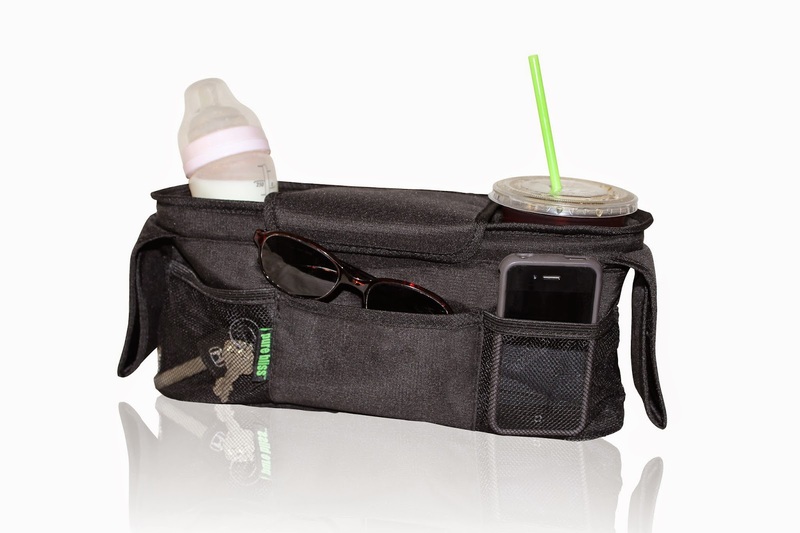 Get your stroller organizer now - You will be glad you did!" 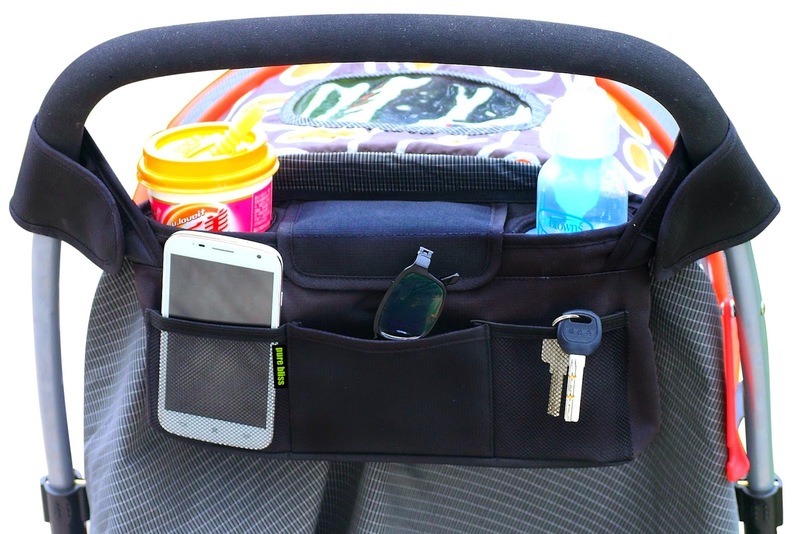 I use a stroller organizer by Dot&Dot and I agree that they are very convenient to use. No need to bring a purse for money, phone and keys.